I'm referring to my ballpen which I was able to consume to the last drop of ink. The Barry Manilow song comes to mind cause "we made it." 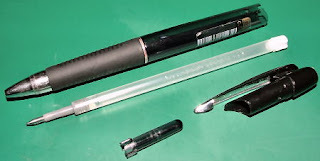 To put it in a clearer perspective, I have a higher probability of misplacing and eventually losing a pen than consuming its entire ink capacity. My ballpen ran out of ink while I was at KFC earlier today filling out a bunch of government forms. I had to buy a new one immediately. Too bad there wasn't any pen like the one I had... only some puny ballpens which I was forced to choose from. The other day though, I remember using my pen while brainstorming for lyrics. And so I dedicate this to you, my beloved pen. Forgive me for I have to replace you. Do not despair, you have served me well. You should try HMV ballpen. I was able to use up 2 already, and I'm about done with the 3rd.